Gamma-aminobutyric acid (GABA) is the main inhibitory neurotransmitter in the adult mammalian brain, but exerts physiologic effects other than that on neurotransmitter in non-neuronal peripheral tissues and organs. GABA may affect cancer growth through activation GABA receptors. We investigated the gene expression of GABA receptors in tissue of non-small cell lung cancers (NSCLC) and non-cancerous tissues, and found that the gene expression of GABA receptor phenotypes was correlated with tumorigenesis and clinical prognosis. Sixty-one snap-frozen human samples of NSCLC tissues and paired non-cancerous tissues (5cm away from tumor) were analyzed. Gene expression of GABA receptors was detected by Real-time quantitative PCR (RT-qPCR). Survival times in relation to the expression of GABA receptor phenotypes were analyzed. Human NSCLC cell lines H1299, A549, H520, H460 and human bronchial epithelial cell line BEAS-2B were used to determine the phenotypes of GABA inhibitory effects on cancer cell growth. The effects of exogenous administration of GABA on H1299 cell growth were examined. The gene expressions were significantly higher in NSCLC tissues than in the paired non-cancerous tissues for GABAA receptor subunit α3 (GABRA3, P = 0.030); for GABAA receptor subunit epsilon (GABRE, P = 0.036); and GABAB receptor subunit 2 (GABBR2, P = 0.005). Kaplan-Meier curves showed that patients with high expression of GABBR2 gene and low expression of GABRA3 gene had a better prognosis (P < 0.05). The administration of GABA resulted in suppressed proliferation of NSCLC cell lines in a dose- and time-dependent manner. The use of the GABA receptor antagonist CGP35348 could reverse the inhibitory effect. The pattern of GABA receptor gene phenotype expression may be involved in the regulation of tumorigenesis. A high expression of GABBR2 with a low expression of GABRA3 may predict a better outcome. The treatment with GABA attenuates cancer cell growth in vitro. The expression of GABA receptor may be not only promising genetic therapeutic targets but may also serve as valuable prognostic markers for NSCLC. Cancer is a major global public health problem. One in 4 deaths in the United States is due to cancer . Lung cancer is comprising 17% of the total new cancer cases and 23% of the total cancer deaths . Non-small cell lung cancer (NSCLC) accounts for about 80% of all lung cancer cases where adenocarcinoma is dominantly presented . Conventional treatment of NSCLC has improved survival, but the 5-year survival rate is approximately 16% over the past 30 years . Novel and effective methods are urgently required for lung cancer therapy. Gamma-aminobutyric acid (GABA) is the main inhibitory neurotransmitter in the adult mammalian brain via activation of specific GABA receptors highly expressed in the central nervous system (CNS) [4, 5]. GABA receptors are composed of GABAA and GABAB receptors. GABAA receptors are ligand-gated chloride channels composed of five subunits. These subunits are encoded by 19 different genes that have been grouped into eight subclasses based on sequence homology (α1–6, β1–3, γ1–3, δ, ϵ, θ, π, ρ1–3). GABAB receptors are heterodimeric G-protein-coupled receptors (GPCRs) composed of GABBR1 and GABBR2 subunits which are both required for normal receptor functioning . It has recently revealed that GABA and its receptors also exist in non-neuronal peripheral tissues and organs, indicating that GABA exerts physiologic effects other than the inhibitory neurotransmitter property. In fact, GABA has been shown to be involved in the development of many tissues and organs, including the peripheral nervous system , the development of the palate , lung , pancreas , digestive tract , liver , chondrocytes , testicular cells  and even stem cells . Given that GABA participates in the proliferation of various normal cell types and tissues, it is intriguing to consider the potential function of GABA in cancer cells. Recent studies gave the evidences that GABA and its receptors seemed to play critically regulative effects on many kinds of cancers [12, 16–31]. In most cases, the levels of GABA receptors accompanying other growth signaling components had significant changes in cancer cells. This raised the possibility that manipulating GABA receptor activity might inhibit tumor growth . In this study, we tested the hypothesis that GABA receptor profiles modulate cancer survival. We thus investigated the gene expression of GABA receptor phenotypes in NSCLC tissues and paired non-cancerous tissues obtained from surgical patients to correlate the GABA receptor gene profiles with clinical outcome. To examine the specific effects of GABA receptor on lung cancer cell growth, we investigated the GABA receptor profiles in cancer cell lines and in normal human epithelial cell line in the presence and absence of exogenous administration of GABA. Human NSCLC cell lines H1299(adenocarcinoma), A549(adenocarcinoma), H520(squamous cell carcinoma), H460(large cell carcinoma) and normal human bronchial epithelial cell line BEAS-2B (ATCC, Rockville, Maryland) were cultured at 37°C with 5% CO2 in DMEM (Gibco, Beijing, China) supplemented with 10% FBS (Gibco, Beijing, China) without antibiotics. To measure the proliferation of cells, the colorimetric 3-(4, 5-dimethyle thiazol-2-yl)-2, 5-diphenyl tetrazolium bromide (MTT) assays (Sigma) were used in vitro. In the MTT assays, cells were seeded into 96-well plates (2 × 103 cells per well), grown overnight, washed in PBS, and incubated with GABA (Sigma-Aldrich) at 0.1 μmol/L to 500 μmol/L in the presence or absence of 100 μmol/L picrotoxin (PTX, GABAA receptor antagonist) or CGP35348 (CGP, GABAB receptor antagonist), respectively. MTT was then added (10ug/well) for 4h. Formazan products were solubilized with DMSO, and the optical density was measured at 490 nm. Sixty-one samples of NSCLC tissues and paired non-cancerous tissues (5cm away from tumor) were collected from the Thoracic Cardio Surgery Department of the First Affiliated Hospital of Guangzhou Medical College under full ethical clearance by the Guangzhou Medical College Ethics Committee for experimentation on human subjects. Informed written consent was obtained from the participants. All subjects were Chinese. The collected samples were immediately cut into small pieces and snap-frozen in liquid nitrogen until further use. All tumor tissue and paired non-cancerous tissue samples were pathologically confirmed. Total RNA from cell lines and liquid-nitrogen-frozen NSCLC tissue samples were extracted using Trizol reagent (Invitrogen). First-strand cDNAs were synthesized using primerscript RT reagent kit (Takara). Briefly, a mix of 2 ug RNA, 2 μl of 5× gDNA eraser buffer and 1 μl of gDNA eraser in a final volume of 10 μl with RNase free DH2O, was incubated at 42°C for 2 min to get rid of gDNA, and placed on ice for at least 1 min. Then 4 μL 5× Primerscript buffer, 1 μL Primerscript RT enzyme mix I, 1 μL RT primer mix, and 3 μL RNase free DH2O were added, and incubated at 37°C for 15 min followed by 85°C for 5 sec. The cDNA samples were stored at -20°C until use. Primers were designed using Primer Premier 5.0 and oligo 7 Software. Each primer pair was verified for gene specificity using Nucleotide Basic Local Alignment Search Tool from the GenBank non-redundant nucleotide sequence database (National Centre for Biotechnology Information, 2009, http://www.ncbi.nlm.nih.gov/). The sequence of each primer pair and the expected amplicon size were summarised in Table 1. PCR was performed to pick out the genes expression in NSCLC cancer cell lines using Premix Taq® version 2.0 kit (Takara). The reaction condition was followed: initial denaturation at 95°C for 1 min; 35 cycles of 30 sec at 95°C; 30 sec at 58°C; and 30 sec at 72°C; followed by a final 3 min extension at 72°C. 3% Agarose gel was used in electrophoresis to separate the reaction products at 80V, 40min. After dyeing with ethidium bromide, the Gel Doc™ EZ Imager (BIO-RAD) was used for imaging. Real-time quantitative PCR was carried out in tissues cDNA samples using the SYBR® Premix Ex Taq™ reagent kit (Takara) through ABI PRISM®7900 HT Fast Real-Time PCR system (Applied Biosystems). Briefly, 2 μl of each cDNA product was amplified in a mixture containing 12.5 μl of 2 × SYBR® Premix Ex Taq™, 0.5 μl of 10 μmol/L PCR sense primer and the same quantitative antisense primer with dH2O in a final volume of 25 μL. The RT-qPCR was performed using the following parameters: initial denaturation at 95°C for 30 sec, 40 cycles of 5 s at 95°C, 30 s at 60°C. The dissolved curve was added to verify the specificity of amplified products. Wells with no template were included for each primer set as a negative control. In each experiment, samples were amplified in duplicate for each of the genes of interest and the reference gene. Only average CT values with a standard deviation <0.5 were accepted. The expression of each gene of interest was determined in relation to the reference gene 18S rRNA. The difference in the mean CT values of the duplicate samples against the reference gene was calculated to give the ΔCT. The relative quantitation value was then expressed as two times -ΔCT (2–ΔCT). Analysis of the 2–ΔCT values data was performed using SPSS 13.0 followed by Paired-Samples t Test and Independent-Samples t Test where appropriate. Correlation analysis was carried out for GABA concentration and cell growth over time. Survival times between groups were displayed by Kaplan-Meier curves after a log-rank test. P<0.05 was considered statistical significance. To examine the effects of administration of exogenous GABA on cancer cells proliferation in vitro, MTT assays were performed on the H1299 cells at broad range of concentrations of GABA(0.1-500 μmol/L). There was a dose- and time-dependent inhibition of cell proliferation with GABA (Figure 1A, B). The GABA concentration used was negatively correlated with the proliferation index (Figure 1C, r = -0.778, p < 0.001; Figure 1D, r = -0.876, p < 0.001). This inhibitory effects of GABA on cell proliferation was blocked by the use of CGP, a GABAB receptor antagonist, while PTX, a GABAA receptor antagonist, had no effect (Figure 1E, F). Similar results were observed in other NSCLC cell lines, such as A549, H520, H460 (data not show). The effects of GABA and GABA agents on NSCLC cell. H1299 cell proliferation was suppressed by GABA in a dose-dependent manner measured by MTT assays (Figure 1A and C). The inhibitory effects of GABA (100 μM/L) on H1299 cell growth were time-dependent (Figure 1B and D). This inhibitory effects of GABA (100 μM/L) on H1299 cell growth was blocked by CGP co-cultured but not by PTX (Figure 1E and F). Proliferation index was calculated as the ratio of the absorbance of cells incubated with GABA or GABA agents compare with negative controls (NC) which was defined as the cells cultured only with complete medium. N =3. *P < 0.05, ** P < 0.01, *** P < 0.001 vs NC. 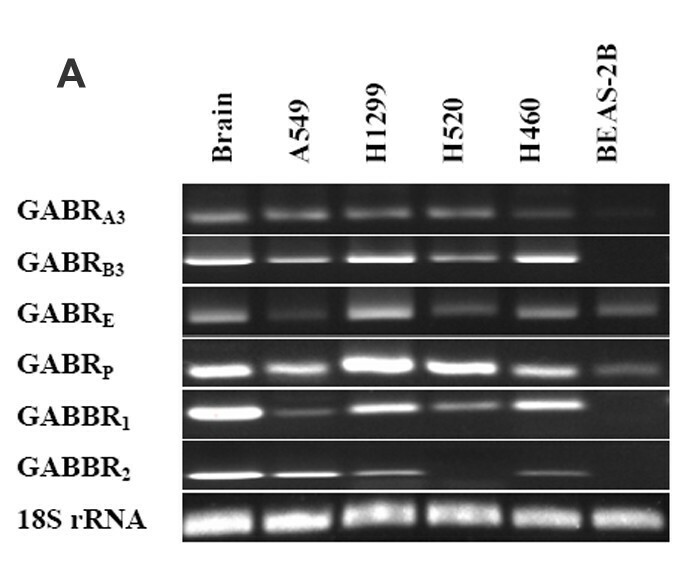 The mRNA profile of GABA receptors was determined in NSCLC cell lines including H1299, A549, H520, H460 and BEAS-2B. The mRNA of human brain (a kind gift from Dr. He Junde, Department of neurosurgery in the same affiliation as ZX) was used as positive control and the normal lung bronchiolial epithelial cells BEAS-2B served as negative control. We found that six GABA receptor subunits were expressed in most NSCLC cell lines including GABAA receptor subunits (GABRA3, GABRB3, GABRE, GABRP) and GABAB receptor subunits (GABBR1 and GABBR2) (Figure 2A and B). The mRNA profile of GABA receptors in NSCLC cell lines. Figure 2A show that GABRA3, GABRB3, GABRE, GABRP, GABBR1 and GABBR2 ecpress in NSCLC cell lines. Brain expression acts as a positive control and BEAS-2B as a negative control. Figure 2B show three times of the PCR for gene relative expression. * P < 0.05, ** P < 0.01. The gene expression of GABRA3, GABRE and GABBR2 was significantly higher in primary NSCLC tissues than in the paired non-cancerous tissues (GABRA3, t = 2.227, P = 0.030; GABRE, t = 2.148, P = 0.036; GABBR2, t = 2.928, P = 0.005; Figure 3A, B and C). There was no significant difference observed in the expression of GABRB3 (t = -0.330, P = 0.742), GABRP (t = 1.072, P = 0.288) or GABBR1 (t = -0.326, P = 0.746, Figure 3D, E and F) in the same tissues examined (Table 2). Gene expression levels in all NSCLC tissues and paired non-cancerous tissues. Relative expression is presented as 2-ΔCT ± S.E. The expression of 18S rRNA acts as reference gene. There is a significant increase in gene expression for GABRA3 (*P = 0.030, Figure 3A), GABRE (*P = 0.036, Figure 3B) and GABBR2 (**P = 0.005, Figure 3C) in NSCLC tissues, with no difference in expression for GABRB3 (P = 0.742, Figure 3D), GABRP (P = 0.288, Figure 3E) and GABBR1 (P = 0.746, Figure 3F). * P < 0.05, ** P < 0.01. The data of GABA receptor gene relative expression were expressed as mean ± SE. Normal: Paired non-cancerous tissue. * P < 0.05, ** P < 0.01. Using the median of 2-ΔCT value as cutoff point, the data was divided into high and low expression for analysis. A high expression of GABBR2 in the lung tissue was associated with better survival as compared to those where low expression was detected (Figure 4B). However, a higher expression of GABRA3 was associated with a lower survival rate (Figure 4A). Smoking and TNM stage were also the important influential factors of decreased survival (Figure 4E, F). Expression of GABRE and pathological grade did not appear to influence on survival time (Figure 4C, D). 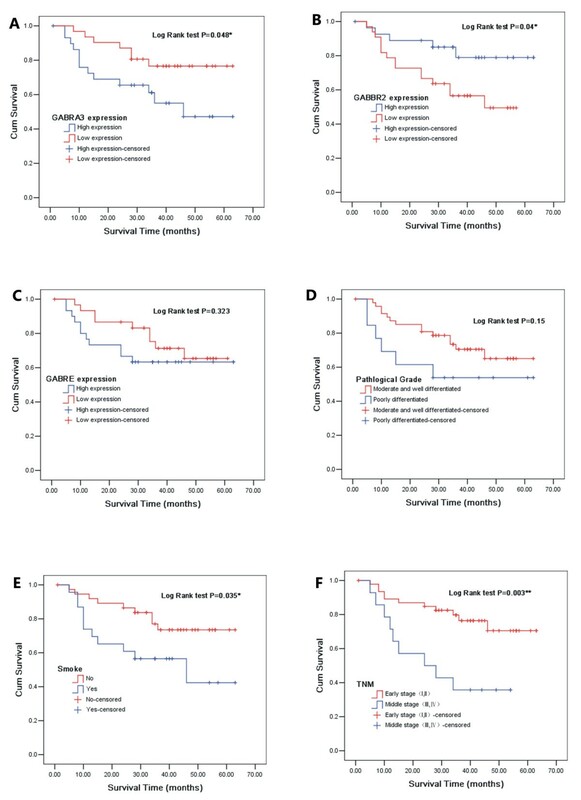 Kaplan-Meier survival curves of NSCLC patients based on various influential factors. Figure 4A, Overall survival rate in patients with high expression of GABRA3 was significantly lower than that in patients with high expression. 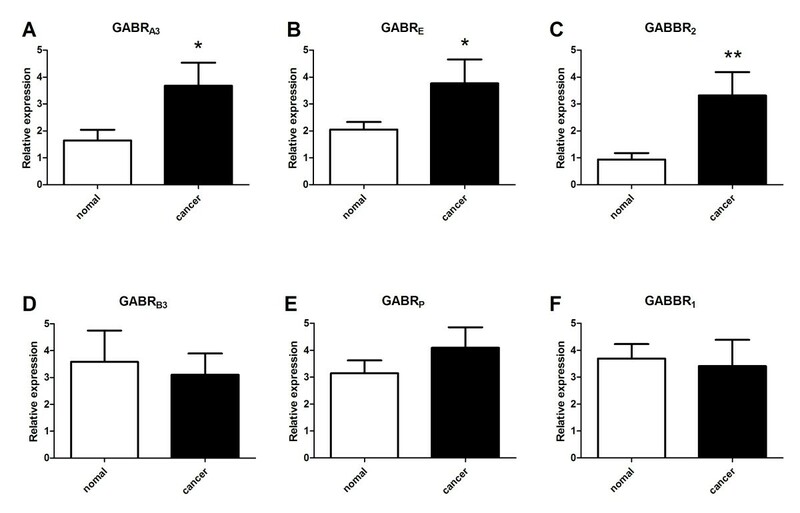 Figure 4B, Overall survival rate in patients with high expression of GABBR2 was significantly higher than that in patients with low expression. Figure 4E, F, the smokers and the patients in advanced stage had a shorter survival time. Figure 4C, D, In spite of curve separated, GABRE and pathological grade seemed to have no influence on survival time. * P < 0.05, ** P < 0.01. The gene expression of GABRA3 was significantly higher in the NSCLC tissues in male patients, while the expression of GABBR2 was significantly higher than paired controls in the patients of female (Table 3). It appeared that the gene expression of both GABRA3 and GABBR2 was higher in the patients with early stage of pathology, but not in the advanced stages. Pathological grade I: well differentiation, grade II: moderately differentiation, grade III: poorly differentiation. Pathological stage refers to the 7th Edition of TNM Classification of Malignant Tumors form UICC. P-value represents the gene expression of GABA receptor in NSCLC tissues compared with that in paired non-cancerous controls. NS: no significant difference. *P < 0.05, ** P < 0.01. GABA and GABA receptors act as an inhibitory neurotransmitter in the mature CNS, but their functions in non-neuronal cells or tumor cells are not well addressed. Previous investigation has reported that GABA is significantly decreased in NSCLC tissues . The previous observation maybe explained by our current findings demonstrating that GABA exerts inhibitory effects on human NSCLC cell. Our results further demonstrate that GABAB receptors play an important role in mediating the GABA-inhibitory effects on NSCLC cells since the effects were blocked by using the antagonist CGP35348 specific for GABAB receptor. Decreased GABA level might have resulted in impaired inhibitory effects on cancer cell proliferation as seen clinically . A compensatory mechanism may be required by enhancing the expression of GABAB receptors in order to redeem the impaired inhibitory effects. The etiological factors of lung cancer are still not clear, but the tumor progression is associated with genetic changes and is reflected in phenotypic changes such as altered gene expression profiles. In this study, we found that the six genes of GABA receptors are expressed in most of NSCLC cells and tissues, including GABRA3, GABRB3, GABRE, GABRP, GABBR1 and GABBR2. These subunits might compose functional GABAA and GABAB receptor. These genetic changes suggest that GABA receptors have close relationship with NSCLC progression. As for GABAB receptors, it is now well accepted that GABAB receptors assemble into heteromers composed of one GABBR1 and one GABBR2 subunit, which are both required for normal receptor function [6, 32]. Some recent reports have suggested that GABA inhibits neoplastic proliferation via GABAB receptor [23, 26]. Since GABAB receptor could strongly inhibit base level and isoproterenol-induced cAMP, p-CREB, cyclic adenosine monophosphate response element-luciferase activity and p-extracellular regulated kinase-1 (ERK1)/2 and effectively blocked DNA synthesis and cell migration. The inhibitory cancer cells arrest in G(0)/G(1) phase which is associated with down-regulation of intracellular cAMP level . In our study, GABA inhibited proliferation of NSCLC cells in a dose-dependent and a time-dependent manner. This inhibitory effect could be blocked in the presence of GABAB receptor inhibitor CGP35348. However, co-cultured with GABAA receptor inhibitor picrotoxin, there were no significant proliferative effects on cancer cells versus control. These results imply that GABA inhibition of NSCLC cell proliferation was associated with GABAB receptor which coincides with the report by Schuller and Al-Wadei [23, 26]. The high level expression of GABAB receptor gene in NSCLC tissues compared with the adjacent non-tumor lung tissues, implicated that GABA and GABAB receptor pathways could be a critical factor in regulation of NSCLC cells proliferation. This pathway might be a promising molecular target for the development of new therapeutic strategies for antineoplaston. As for GABAA receptors, it has been demonstrated that GABAA receptors are usually composed of two α subunits, two β subunits, and one γ subunit, and sometime the γ subunit is replaced by other subunits, such as δ, ϵ, π and θ . Different GABAA receptor subunits have been detected in many cancer cell lines and tissues. Li et al. detected overexpression of GABRQ in hepatocellular carcinoma cell line HepG2, and half of the tested hepatocellular carcinoma tissues. Takehara  identified the overexpression of GABA receptor pi subunit (GABRP) in PDAC cells. In gastric cancer, more than five GABAA receptor subunits were associated with stimulating KATO III cells . The similar results that GABAA receptors are related to cancer cell proliferation were reported in prostate cancer , breast carcinoma , even in normal human small airway epithelial cells . These findings imply that the inward Cl— ionic current transport and the activated mitogen-activated protein kinase/extracellular signal-regulated kinase (MAPK/Erk) cascade via GABAA receptors positively promotes cell proliferation. Our study revealed that the GABRA3 receptor gene was overexpression in NSCLC tissues compare with paired non-cancerous tissues, this was consistent with the study reported by Liu et al. . In addition, beside overexpression of GABRA3 and GABRE genes, the other GABAA receptor genes expression in our study including GABRB3 and GABRP were also detected in lung cancers, although there was no significant difference between NSCLC tissues and paired non-cancerous tissues. These GABAA receptor subunits may form a functional pentameric chloride channel. We observe that the overexpression GABRA3 and GABRE genes were not associated with proliferative effects on cancer cells. This indecipherable phenomenon will lend us to take more investigations of their roles in lung cancers. Furthermore, our clinical data analysis showed that both GABAA receptors (GABRA3) and GABAB receptor (GABBR2) genes were significantly expressed in the early pathological stage (stage I and II) of the lung cancer patients, and the expression was gone in stage III and IV. This suggests that high level of gene expression of these GABA receptors may be critical in inhibition of early stage of cancer cells and this regulatory effect got impaired in advanced stage. We speculate that therapeutic intervention approaches that enhance GABA receptors maybe beneficial in late stages of NSCLC patients. We observe a correlation between the high expression of GABBR2 gene and the greater survival rate in patients with NSCLC. The overexpression of GABBR2 gene was mostly seen in female patients who had better outcome. This suggests that patients with higher level GABBR2 might have better outcome. This observation is consistent with previous in vitro data showing that high level GABBR2 gene expression is associated with inhibition of cancer cell proliferation [26, 39, 40]. In contrast, high level GABRA3 gene expression is correlated with cancer cell development [12, 35, 41], and thus these patients had worse outcome. We indeed showed that the higher gene expression of GABRA3 was mostly detected in those male patients who had a worse prognosis. Our data was based on a relatively small sample size of 61 patients with NSCLC who were followed for 3–5 years. Our data suggests that the gene expression of certain GABA receptor subunits may be useful for prediction of NSCLC prognosis. We believe that a longer term follow-up study with larger sample size would be required to confirm our current findings. The present study has identified significant gene profiles of GABA receptors in NSCLC and the gene profiles are correlated with patients’ survival. Exogenous administration of GABA can inhibit NSCLC growth by activation on GABA receptors. Our data suggests that GABA receptors can modulate cancer cell proliferation and their gene profiles may be able to help predict prognosis in patients with NSCLC. The authors thank Mo Lili for valuable help with preparation of the tissue samples and all members in He Jianxing’s lab for their technical assistance. ZXX participated in all experiments and drafted the manuscript; ZR participated in the RT-qPCR assays; ZYJ, SJF, LJ, SXS, HLY, THL, and LJ carried out collection of the NSCLC tissue, RNA extraction and clinical data analysis; XDK took part in the statistical analysis; HJX participated in the study design; ZHB initiated the study design, participated in data analysis and manuscript writing. All authors read and approved the final manuscript.